Hello everyone! The last time I posted I mentioned that I took a spill and injured my back. What I didn’t mention was that the next day we boarded a plane. Part of the family visit involved going to four countries. Fortunately for me, the first flight wasn’t too long since my back was killing me and I could only sit in certain positions. It’s feeling much better now and I would like to thank everyone for their kind comments. Now that we are back in London we only have a couple of days until the family heads back home. I thought I would post a photo from our first stop to see if anyone can guess where we went first. In a few days I will be able to fill all of you in more on our vacation. I hope all is well and soon I will be able to visit your blogs and catch up. This entry was posted in Travel and tagged 50 Year Project, Life, Photography, Travel, Travel Blog, Travel Journal, Travel Photo. Bookmark the permalink. We have all missed you TBM!!!! And I don’t have a clue about the location of the photo. Ah…it is nice to be missed. Thanks! Glad to hear you are doing much better. Can’t wait to see more of your photos. Don’t have a clue to where this photo is taken. Are those U.S. flags on top of the building? Not US flags, but I selected a photo that didn’t have them flying too much to make the game a little harder. They’re German flags over the Reichstag in Berlin. Vienna is pretty close, but the answer is Berlin. I haven’t been to Vienna yet and I would love to go. The weather in Berlin was fantastic, mostly hot. It rained one night while we were at a cafe. So very romantic until we had to run back to the hotel soaking wet. But how often do I get to run by the Brandenburg Gate on a rainy night. Answer, so far only once. Berlin, the Reichstag?! Have been there and it looks familiar, beautiful city. So glad you are on the mend! We’ve missed you, TBM! Glad to hear you’re feeling better. Thanks Robin! I would never associate you with ignorance. Oh, I do appreciate that! My guess is the Reichstag Building in Berlin. I’d like to visit Berlin someday. I also tried to focus in on the flag at the top left of the building to see what country it belonged to. I really enjoyed seeing Berlin. I studied German history in school so it was a real treat for me to visit! I hope you see it someday. Glad you are feeling better and also got I go on a nice trip! I’m guessing Madrid for the photo.. I haven’t been to Madrid yet, unless you count the airport (which I don’t). I’m both sorry to hear about your injury (isn’t the timing of things great?!?!) and happy to hear that you are on the mend. I hope you have had a wonderful time with your family and look forward to hearing all about it, and commiserating with you over the melancholy of their departure. Glad to hear you’re feeling better. Take care and looking forward to your next posts! Thought maybe Berlin – few people have also said that so maybe it is? Haven’t been but thought I recognised from some pics I’d seen. It is Berlin! Great job Lynn! Missed you! Sounds like you had an amazing time with the family 🙂 Back to work you! Thanks! The back to work bit is tough though. Thanks T. F…now I just need to organize all of the photos. Nice to see you. I’m going for Berlin and the Reichstag building too. I’m glad to hear you are feeling bettr. 4 countries. That’s ambitious. Not sure where you tokk the photo but the flag says Germany. 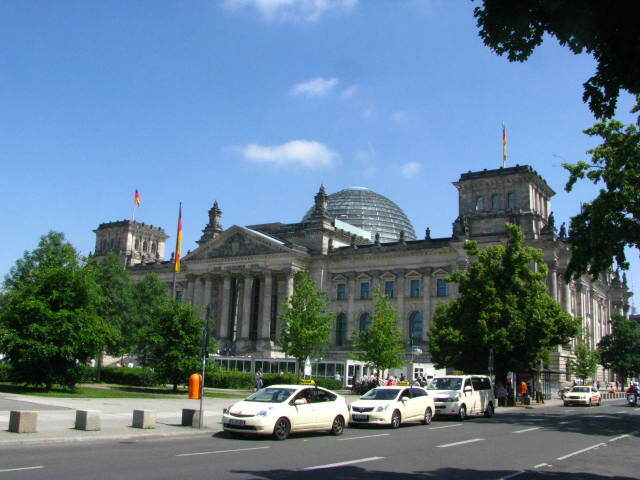 Yes it is a German flag and the photo is of the Reichstag. 4 countries involved a lot of flights, but fortunately all of them were under an hour until the one home so it wasn’t too bad. Thanks Novroz…the pain is almost gone completely. Welcome back! I’m glad your back is better. Four countries? You guys really get around! It is so nice how eveything is close together over there. I miss that. Being able to travel in Europe was one of the biggest draws of moving to London. Everything is so much easier to get to for a decent price. We are trying to make the most of it. I did the same thing when I lived in Bavaria. Sooo easy to travel to so many places. Thanks Nia! And yes, it was taken in Germany. Berlin to be exact. Glad you are feeling better TBM. Enjoy the rest of your trip. Thanks Madhu and you’re right!